WRAPUP: We had a small crowd of 5 MINIs gather due to wet weather. The advantage was light traffic, and a bit more excitement throught the twisty bits. After 55 miles of exploring back roads we headed off to a nice breakfast. The perfect start to a Saturday morning!! We had about 30% of our membership participate in this election. Thanks for all who sent in their votes!! 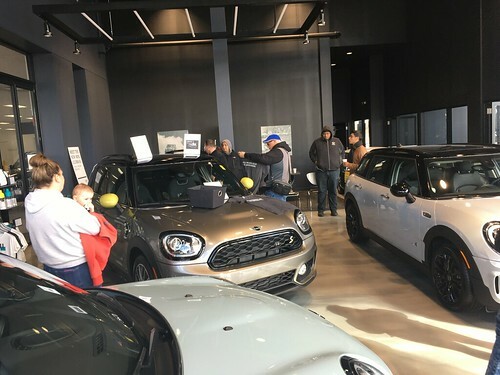 We will be working on continuing to make the Chicago MINI Motoring Club a fun place to be. If you have ideas, and are interested in helping, please contact any of the board members either via e-mail or at our events. UPDATE 06/04: With 4 days to go, the top 3 candidates are currently all within 1 vote of each other, and the other 2 are not very far behind. Here are the five candidates for the two open CMMC Board Member at Large postions to replace outgoing members Taylor and Victoria. Voting will continue until June 8th, and the board members will be announced a few days later. Both of these positions will entail working with vendors, helping with events and generally lending a hand with day to day and week to week with running of the club. We’re happy to tailor the exact responsibilities of each position to what interests the person(s) who end up filling them. To become a candidate, please email our president Steve Rosenblum at steve@chicagominiclub.com. In other board news, our founding President Gabe Bridger has stepped down and will take over the Vice President role for the remainder of his tenure. Long time VP Steve Rosenblum has filled the position as President for the remainder of his term. In 2008 we will be putting up the remaining four board positions for election including President and Vice President. Candidates have until May 30th to announce that they’re running for one of the “Board Member at large” positions. Voting starts on June 1st (06/01/07) and will run for eight days (until 06/08/07). You need to be a current member to either run or vote.